As part of Iowa’s effort to become the healthiest state in the nation, residents are encouraged to join their co-workers, neighbors, family and friends in taking a walk on Wednesday. Dozens of cities statewide are hosting the one-kilometer Healthiest State Walk. Dr. Mariannette Miller-Meeks, director of the Iowa Department of Public Health, says more than 100,000 people have already signed on for the jaunt. “You don’t have to register to walk but we’d like people to go to the IowaHealthiestState.com website and pledge to walk,” Miller-Meeks says. Many of the walks are being organized around noon on Wednesday so people can take the short hike over their lunch hours. If you’re not sure of the distance of one kilometer, Miller-Meeks says don’t be daunted. It’s only about a 12-minute stroll for the average walker. “It’s about seven city blocks so it’s not that far,” Miller-Meeks says. Besides walking, health officials are hoping Iowans will add other wellness activities to their schedules, ranging from playing outside with your children to eating a healthy meal together as a family to volunteering in the community. The effort to become the nation’s healthiest state within five years was announced last year. In 2011, Iowa ranked 16th compared to all other states, moving up from the 19th position in 2010. 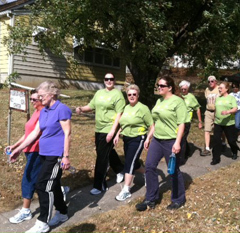 Sign up for the Wednesday walk event and find or create a local, organized walk at: www.iowahealthieststate.com.